Cemeteries can often provide you with important information about your ancestors. The date of death or burial provided by the cemetery can be especially helpful in finding death certificates and obituaries. Also the names of additional persons buried with your ancestor will help to establish family relationships. There are a number of cemeteries in Hudson County, NJ which may contain the last remains of one of your ancestors. Following is a listing of addresses, phone numbers and comments on each of the local cemeteries. When contacting the cemeteries make sure to provide them with as much information as possible including names and approximate dates of death. One of the oldest burial grounds in North America with burials dating back to the 1660's. The burial records of this cemetery have been published and are also available on microfilm from a Family History Center of the Church of Later Day Saints. Address: 11 Highland Avenue, Jersey City, NJ 07306. Phone 201-433-1815. Hudson County Highlight: Buried at Old Bergen is Jane Van Reypen Tuers, heroine of the American Revolution. It was Tuers who passed along information about the betrayal of Benedict Arnold which lead to his undoing. Formed by a merger of the two named cemeteries this large cemetery is located in the south eastern section of Jersey City overlooking the Statue of Liberty. Burials date to 1846 and the cemetery has kept good records, however records in the older New York Bay section are not alphabetized. You must provide a date of interment for that section. The staff is very helpful and will answer both mail and telephone requests. On the phone, they will search and provide lot number and interment date on one or two people. A summary from the interment records will be mailed to you for $15.00 for the first person and $3.00 per additional name. The summary will give all additional information such as date of death, residence, cause of death. Address: 321 Garfield Avenue, Jersey City, NJ 07306 Phone: 201-433-2400. This small cemetery is located in the center of Jersey City and has been in existence since 1831. (See history of Jersey City Cemetery). Up until January 2000 the cemetery was under the care of a less than helpful person and gaining information was differcult, if not impossible. New caretakers, Jorge and Flor Peralta, have taken over and promise improvement in answering requests for information. Records go back to at least 1873 and earlier records may be undercovered. No alphabetical index is maintained. Since burial are recorded by date you must provide at least an approximate date of death. Address: 435 Newark Avenue, Jersey City, NJ 07306 Phone: 201-653-1360. See this Jersey Journal article. Hudson County Highlight: Holy Name Cemetery is the final resting place for Frank Hague, one of the most powerful and colorful political leaders of the first half of this century. Despite its name this cemetery is located in North Bergen having moved from Hoboken in 1859. Record keeping for this cemetery has not been very good and the staff is generally not very helpful. 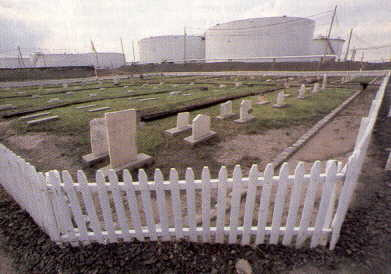 Early in 1998 the Cemetery entered receivership. I suggest only writing for information and hoping for the best. Address: 5500 Tonnelle Avenue, North Bergen, NJ 07407 Phone: 201-867-0635. Hudson County Highlight: Buried in Flower Hill Cemetery is Decatur Dorsey, an African American winner of the Congressional Metal of Honor for his bravery during the Civil War. Variously known as the DeMott Burial Ground and the Speer Burial Ground this cemetery represent the hard times that can befall a cemetery. Located in a heavily congested area in the center of Jersey City this cemetery is reported to have been the burial site for members of the DeMott family dating back to the 1660s. The cemetery was purchased by Albert Speer, a Jersey City mortician, in 1857 and burials continued until after World War I. After that time the cemetery fell into disrepair and for a period of time was not even surrounded by a fence. Records of the cemetery have been lost and no one is even sure how many people are buried here with estimates from several hundred to several thousand. Few tombstones remain and if your ancestors were buried here there is a good chance you may never find them. The final resting place for the residents of the Hudson County Alms House. See Jersey Journal Story. Beware! An ogre is reported to work here. Many people who have phoned here for information have been verbally abused for requesting genealogical information. Others who have visited have been helped by other employees and warned about this particular employee. I recommend writing for information and hoping for the best. A number of bodies from the Old Bergen Cemetery were moved here in the 1920s when a portion of that cemetery was sold for development. Address: 748 Schuyler Avenue, Kearny, NJ 07032-0428. Phone: 201-991-1611. This is a large well maintained cemetery which in actually in the Bergen County town of Fairview, but since it borders on Hudson County, contains many of it's residents.They have very good records and are co-operative. Address: 500 Fairview Avenue, Fairview, NJ 07022. Phone: 201-943-6161. If your ancestors were Catholic and they are not in Holy Name Cemetery they are probably in this Bergen County cemetery in North Arlington, NJ. Again this is a well maintained cemetery with excellent records but expect to be asked for maintenance fees when you ask for information about a relative. Address: 340 Ridge Road, North Arlington, NJ 07031. Phone: 201-997-1900. E-mail Bob Murgittroyd for information about the Cemetery Tour.